The next installment of the basketball simulator series from EA Sports. In the title once again we will have the opportunity to enter the NBA league floor and take under our wings a number of fully licensed teams. NBA Live 19 is the next installment of the once very popular basketball simulator series, which is the work of EA Sports. As the name suggests, the title allows you to lead one of a series of fully licensed teams of the most famous and best basketball league in the world. 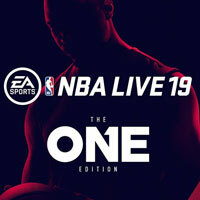 As in the previous edition of the series, also in NBA Live 19 the creators made every effort to ensure that the title reflected the specificity of basketball as closely as possible. That's why they've prepared hundreds of moves that can be combined to provide the biggest advantage on the court. They can be performed by pressing the game pad buttons, and also by manipulating the analogue knobs, especially the right one, which allows for dribbling and simulates the movement of a player's hand during the throws. EA Sports has made a lot of improvements to the game model compared to the previous part. They concern mainly the so-called Real Player Motion, i.e. the technology responsible for the behavior of basketball players. Thousands of new animations were created to make your individual games smoother than ever. It was also attempted to reconstruct the movements of the most famous players, which, combined with refined artificial intelligence, gives the impression of watching real players. The Off-ball and one-on-one game modes were also revamped. Interestingly, the latter element differs depending on whether we are in a league match or competing on a street pitch, where the range of tricks is much greater. With the NBA Live 19, it's not just the interaction of players on the pitch that's at a high level. The possibilities of contacting the reserve bench, the public and the surrounding area have also been expanded. Above all, it’s about animating contact, catching the ball or reacting to what is happening on the court. The NBA Live 19 offers a range of classic play modes, such as single match, season and multiplayer. The heart of the title, however, is the mode called The One, which is the career of a single player created in the editor. Just like last year, it is divided into two segments – The League, where we take part in the NBA league as a player of one of the teams, and The Street, where we compete on street fields. The second element introduces a number of novelties. For example, the rules in a field of play depend on where in the world it is located. Travelling around the globe is useful in the face of another novelty – the possibility of building your own line-up. During our trips we can recruit famous and legendary players, with whom we can set off to conquer the online games. Another new element that has appeared in The One mode is the so-called Ikon system. It is connected with the development of a player created by the player. Initially, one chooses one of the popular players, such as Alan Iverson or Russell Westbrook, and gains certain bonuses that are characteristic of their style of play. If we decide to follow Iverson's path, with the progress of dribbling our basketball player will become much better, while choosing Westbrook, we will develop physical aspects, such as speed or endurance. During a player's career there will also be a lot of choices, both on and off the court. They influence The One mode by creating certain gameplay scenarios that match our style of play. While creating the audiovisual setting, the creators of NBA Live 19 made every effort to best reflect the atmosphere of the basketball match. So in the title we have accurately reproduced the faces of the players, a dynamic commentary, which is to be updated monthly during the season, and the shouts of fans. The game also does not lack licensed tracks playing in the main menu.